This Maudslay Magna, chassis number 5333, was new to Heaps Tours in March 1937 and was sold to Baker, Featherstone in March 1951. Clearly, later still it joined the fair circuit. I have no other information but think the Yorkshire Tykes will be queuing up to furnish the detail. What an interesting specimen, and what a great shame that the breed appears to be extinct! Thanks for posting. What a shame that not one of these revolutionary, and Maudslays most popular PSV chassis, ever survived. Any clues on the bodywork, Willowbrook perhaps? The side flash looks Burlingham but the wheel arch embellishments more like Windover. New -/37, to Heaps as mentioned with a Holbrook 37-seater front entrance body (quite an advanced idea at the time). It passed to Harold Baker t/a J Baker & Son 3/51. The Yorkshire Rose fleet name was in use by 12/54, while the coach left for pastures new 12/54. Presumably it passed to the showman at that time ? Thanks for that MikeB, Was this a solo vehicle or part of a batch, do you know. I thought the chrome strips on the wheel-arch trims may have been added by the showman. Holbrook? That’s a brand most of us won’t have encountered before! It does, as Eric says, look a bit of a cross between Burlingham and Windover. Samuel Holbrook of Wolverhampton metamorphosed, in 1937, out of Holbrook & Taylors, also known as HT Bodies, but in the 1920’s more commonly known as Taylors of Wolverhampton! In 1930, it was specialising in 14-20 seater bodies for Ford and Chevrolet commercial chassis. It built at least two bodies for the Magna, seemingly ordered by Maudslay as demonstrators or for Motor Shows of the period. This vehicle is likely to be first one. It is very attractive and still looks modern in the mid-1950’s. Can someone enlighten me as to what was so advanced or revolutionary about this model, please? Excuse my ignorance. My association with Maudslay vehicles was very limited, confined to some examples that Hutfields of Gosport operated, alongside some beautiful AEC Reliances with Burlingham Seagull bodies and some ex-Southdown lowbridge Leyland Titans. According to David Kaye’s "Buses and Trolleybuses 1919-1945, it was one of the first chassis to have the front axle set back far enough to allow a front, not just forward, entrance (i.e. "Door Forward" rather than "Wheel Forward"). A significant product was the SF40 front engined coach chassis, with set back front axle, which came onto the market in 1934. It achieved quite seccessful sales figures until the advent of WWII. So, the products of Holbrook and Taylor were Wulfrunians, were they? Season’s greetings to all our readers and, no, I’ve not started on the vino yet! Thank you everyone, that’s very helpful. It certainly looked advanced for the time and, of course, I should have noticed that the front axle was set back. Interesting that this model outsold the ‘Q’ from the mighty AEC, but as we know bus operators do tend to be very conservative, which is why there were only three customers for the Routemaster, and one of them, BEA, left operations in the hands of London Transport. Being curious and living not far from Holbrooks in Coventry I thought I would look a bit further into Holbrook Motors. Did not find much except that Harry Holbrook built cars in USA around the same period using "English" technology. Were they related? Heaps nearest competitor locally was one Sammy Ledgard who also had a Maudslay SF40 There is a picture of it on www.sct61.org.uk In later years it’s body was transferred to an ex London wartime Daimler decker! Did Samuel Ledgard buy this coach from new, or acquire it later? There appears to have been no connection with the Wolverhampton company. The Tilling Stevens Successor has been mentioned, but its eight cylinder boxer engine, independent rear suspension and Maybach-designed seven speed preselective constant mesh gearbox are probably reasons for a net sales figure of zero. 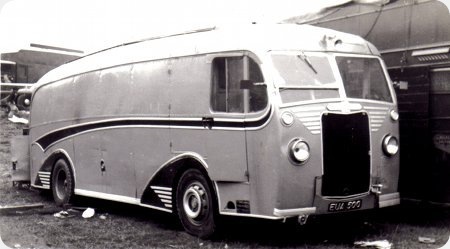 The only AEC Q’s to have provision for a "door-forward" layout (although generally without doors back then) were the double decks and the LT Central Area 5Q5 single deckers, the rest had too short a front overhang. All but the first of the Northern General Transport SE6 single-deckers and all of their SE4s had front entrances (with a sliding door at the front bulkhead) as did 3/4 of the transverse rear engined preselective gearbox BMMO REC. They were of 1935 introduction. The two Chris’s "H" – yes Ledgard did buy CUB 1 brand new – and later when the chassis was withdrawn its body was mounted on the chassis of the Park Royal "relaxed utility" ex London Transport HGF 948(D271). The removed body of the latter was later mounted on the Ledgard Daimler CWA6 JUB 649, whose own Duple body had very uncharacteristically deteriorated prematurely. The Brush body of CUB 1 made for a very strange coach indeed, while the Park Royal body gave JUB 649 a fascinating air by being a unique mixture. For more information see this link.